"Classic elegance" is the phrase that comes to mind when looking at the Madrena bedding ensemble by Croscill. The champagne jacquard medallions of the bedspread pop against the deep teal background. A pleated faux silk bedskirt adds another level of embellishment and dimension to be bed. Luxurious faux silk carries throughout the collection, with trimmings on the accent pillows and window treatments. The European sham and throw pillows also feature delicately beautiful tassels and twisted cording to finish the pieces. Use the scalloped canopy valance alone or paired with the drapery panels to finish off your room with flair. Croscill has been a manufacturer of high quality bedding at affordable prices for more than 50 years! The Madrena Bedding Collection brings a traditional and elegant feel to any bedroom. The comforter and pillow shams feature a luxurious chenille jacquard medallion, in shades of deep teal and champagne, trimmed with a sophiticated tri-color twist cord. The Bedskirt is a beautiful faux-silk and is pleated for added dimension. One (1) Queen Comforter, two (2) Standard Shams, one (1) Bedskirt 15in drop, Comforter measures 92x96, polyester fabric and poly fiber fill, dry clean recommended, imported. Manufactured by Croscill. 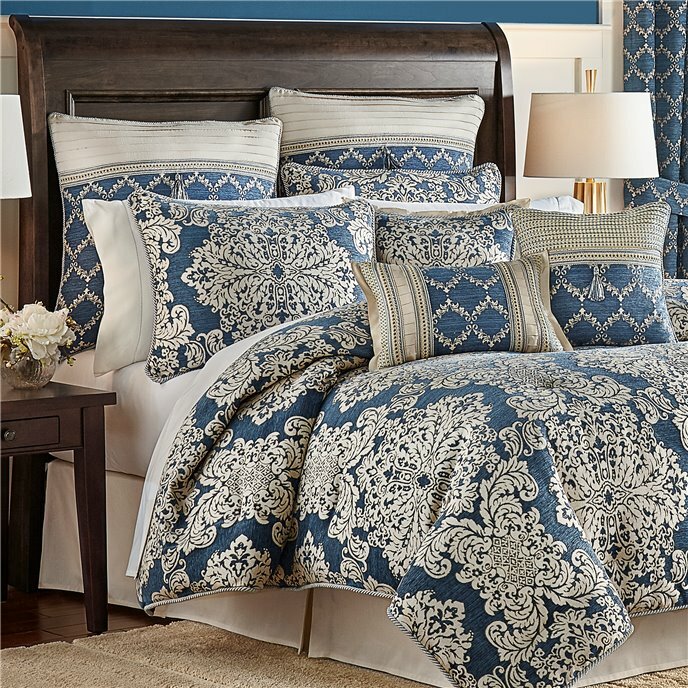 The Madrena Bedding Collection brings a traditional and elegant feel to any bedroom. The comforter and pillow shams feature a luxurious chenille jacquard medallion, in shades of deep teal and champagne, trimmed with a sophiticated tri-color twist cord. The Bedskirt is a beautiful faux-silk and is pleated for added dimension. One (1) Cal King Comforter, two (2) Standard Shams, one (1) Bedskirt 15in drop, Comforter measures 110x96, polyester fabric and poly fiber fill, dry clean recommended, imported. Manufactured by Croscill. The Madrena Bedding Collection brings a traditional and elegant feel to any bedroom. The comforter and pillow shams feature a luxurious chenille jacquard medallion, in shades of deep teal and champagne, trimmed with a sophiticated tri-color twist cord. The Bedskirt is a beautiful faux-silk and is pleated for added dimension. One (1) King Comforter, two (2) Standard Shams, one (1) Bedskirt 15in drop, Comforter measures 110x96, polyester fabric and poly fiber fill, dry clean recommended, imported. Manufactured by Croscill. The Madrena European Sham features a pleated faux-silk pieced together with a chenille pattern and embellished with a gimp and tassel. It reverses to a basket weave textured fabric and is trimmed with a delicate twist cord. One (1) European Sham, Measures 26x26, polyester fabric, dry clean recommended, imported. Manufactured by Croscill. The Madrena 18x18 Square Pillow features the main jacquard medallion centered on the face of the pillow accentuated with a faux-silk flange. This pillow reverses to the faux-silk and is trimmed with a sophisticated tri-color twist cord. One (1) Square Pillow, Measures 18x18, polyester fabric and poly fiber fill, spot clean recommended, imported. Manufactured by Croscill. The Madrena 18x12 Boudoir Pillow features the chenille pattern centered on the pillow pieced with the faux-silk and basket weave texture and trimmed with a gimp. The pillow reverses to the chenille pattern and is finished with a faux-silk flange. One (1) Boudair Pillow, Measures 18x12, polyester fabric and poly fiber fill, dry clean recommended, imported. Manufactured by Croscill. The Madrena Canopy Valance continues the elegant design with the main jacquard medallion, faux-silk trim and tassel embellishment. One (1) Valance, Measures 54x19, polyester fabric, spot clean recommended, imported. Manufactured by Croscill. The Madrena Curtain Panel Pair features the chenille pattern with matching tiebacks. Each panel is lined with a solid white polyester lining and include encased weights in the bottom hem. Two (2) Window Panels, two (2) Tiebacks, Measures 82Wx84L, polyester fabric, dry clean recommended, imported. (2nd image shows valance sold separately.) Manufactured by Croscill. The Madrena Curtain Panel Pair features the chenille pattern with matching tiebacks. Each panel is lined with a solid white polyester lining and include encased weights in the bottom hem. Two (2) Window Panels, two (2) Tiebacks, Measures 82Wx95L, polyester fabric, dry clean recommended, imported. (2nd image shows valance sold separately.) Manufactured by Croscill.